The first step begins on the 14thSeptember at Carrow Road where 8 Apprentices will be selected for an 18 – 24 month program delivered by City College Norwich and supported by Gasway. Gasway are delighted to be working with City College Norwich and sees the Apprenticeship scheme as a fantastic way to make a real difference within theEast Region whilst meeting its own high standards in social values, addressing the industry skills shortage, and continuing its growth as East Anglia’s largest heating company. During the course they will all study towards passing their City and Guilds level 3 Qualification, ACS Gas Certification and be given full Gaswaytechnical training. On successfully completing the program each Apprentice will be offered a full-time position at Gasway Services limited. This program will continue each year creating local sustainable employment by adding a further 8 new apprentices. Those selected will be from a wide variety of ages and educational backgrounds. Some who’ve just left school and looking to forge a career, and some taken directly out of unemployment. With many smaller companies unable to meet the requirements and demands for apprenticeship programs the wider industry anticipates a shortfall in good quality labour and diminishing quality standards. 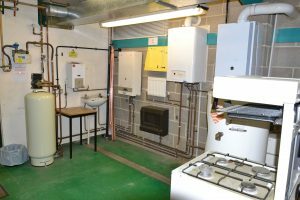 Gasway has accepted an invitation from City College Norwich to help in refurbishing and equipping a new gas training room at the college where the Apprentices will develop their skills. Gasway strongly believes in the importance of it creating social values and continues to work with “Inspired Youth”. Founded as a project in 2010 with the sole purpose of engaging local businesses with local young people.